EPI Plastic New Zealand. Toys, Sports, Children, Baby, Cricket Bats and Balls, Tug Boats, Sport Drink Bottles, Sure Shot, Toilet Trainers. Injection & Blow Moulding. Below is a list and description of most of our Toys, Children, Baby and Sporting Goods and Products. Note all prices are excluding GST. Also see our promo product toys section. Click here for the Dune Buggy Fan Page including Assembly Instructional Video. Note EPI doesn't sell direct to the public, we are always looking for retailers and business people to carry our product. Contact us for information on product and how we can help you sell our product. 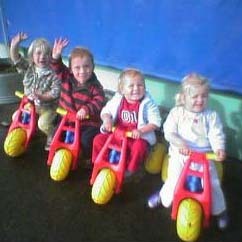 The famous great Kiwi ride on toy - all kids should have one. Real value for money. Fun at xmas or birthdays, help your child assemble it. Excellent value for money for the backyard or the beach. Sold in a plastic bag set. Excellent Value for money. Small multi coloured hard hollow plastic balls. This is the same ball as our cricket set, but sold separately. Stock item ready for immediate dispatch. This product can be printed for you, MOQs apply. See Promotional Products. Old style Post Office Box. Removable cap at bottom gives access to the money. The piller box style is modelled after the historic box outside Olveston in Dunedin. Child's beach or sand pit spade and bucket set. This tends to be a seasonal product so is sometimes not in stock, or has sold out quick. Child's beach or sand pit bucket. Child's beach or sand pit spade. Sure Shot, now called the X-Stream Drink Bottle. Drink Bottle. Various stock colours - red, blue, green, silver etc. We can organise to have your logo printed on the bottle. 500ml Drink Bottle. Available in a huge variety of colours. We can organise to have your logo printed on the bottle click here. 800ml Drink Bottle. Available in a huge variety of colours. We can organise to have your logo printed on the bottle click here. This is not a stock item generally. However, we have the mould and can make to order. Setup costs and minimum runs apply. This makes an excellent printed Promotional Product click on the link to see print prices and volume discounts. Low cost mini flying disk. 85mm in diameter. Available in white, yellow, red, green, blue and black. This makes an excellent printed Promotional Product click on the link to see print prices and volume discounts.Low cost small flying disk. Available in white, yellow, red, green, blue and black. Full size flying disc. Available in white, yellow, red, green, blue and black. Easily fits over adult sized toilet seat to assist the child to become independent. Reduces the size of the hole. Sold in a plastic pack with a header card for good display in the retail environment. 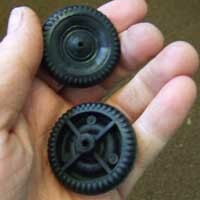 Hollow plastic wheel with axle hole. Stock colours - yellow and black. This is the replacement wheel for our Dune Buggy. The Dune Buggy isn't a stock item now, so the wheel is sometimes not in stock too. Please enqurie. Small Grip for plastic, metal or wooden tube. Stock colour - yellow. This is the replacement part for our Dune Buggy. The Dune Buggy isn't a stock item now, so the wheel is sometimes not in stock too. Please enqurie. Diameter 10.5cm, Width 2cm, Axle hole 6mm. Stock colours are red, yellow and green.